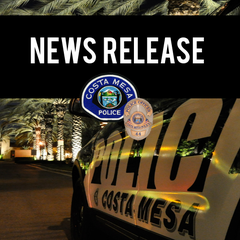 Today, March 8, 2019, at approximately 2:42 p.m., officers responded to a bank located at 234 E. 17th St. regarding a robbery. While en route to the call, it was determined that a man had entered the bank and fled the scene with cash. It was reported he had a gun. No injuries were reported. Our officers arrived and conducted an area check but could not locate the suspect. Wearing a button-up shirt, black jacket, dark pants, and black-rimmed glasses. This is an active investigation and anyone with information about this robbery is asked to contact the Investigative Service Bureau at 714-754-5205.